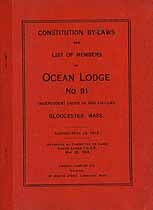 Constitution, By-Laws and List of Members of Ocean Lodge, No. 91, Independent Order of Odd Fellows, Gloucester, Mass. Adopted April 22, 1918. Approved by Committee on Laws, Grand Lodge I.O.O.F. May 28, 1918. Names in this online transcription include Abbott, Acker, Ackert, Adams, Allan, Anderson, Andrews, Anstess, Aptt, Archer, Arnold, Atwood, Babson, Bailey, Baker, Baldwin, Bannister, Barnard, Barton, Beaman, Bedwin, Bennett, Bernstein, Berry, Bibber, Biggs, Blatchford, Bloomberg, Blynn, Boardman, Bocken, Bradstreet, Bragdon, Bray, Brinnick, Brooks, Brown, Buckhart, Burnham, Butler, Cahoon, Cairns, Calder, Cameron, Campbell, Canning, Carlson, Carter, Casey, Center, Chase, Childs, Christenson, Clairborne, Clark, Coad, Coas, Cobb, Cogswell, Cole, Collins, Comeau, Conrad, Conway, Cook, Cox, Crane, Cressey, Cressy, Critchett, Curtis, Daley, Dalton, Darlington, David, Davis, Day, Deacon, Decker, Dennen, Dexter, Dixon, Dodman, Donahue, Dorrance, Douglass, Driggers, Duncan, Dutton, Dwyer, Elwell, Fernald, Flagg, Flye, Flygare, Foley, Francis, Frawsel, French, Friend, Frost, Fudge, Fueless, Gaffney, Garland, Gayton, Gilbert, Gill, Gillie, Ginns, Glover, Goldthwait, Goodhue, Gosbee, Goucher, Graham, Grant, Gray, Grear, Green, Greene, Greenleaf, Greenlow, Greenwall, Griffin, Grover, Hadley, Hall, Halverson, Hamilton, Hanson, Harding, Hardy, Harris, Hart, Harting, Haskell, Hausner, Havner, Hawkins, Hawson, Hazel, Heaps, Heckman, Henn, Higgins, Hills, Hinckley, Hodgkins, Holmberg, Holmes, Honnors, Howard, Howell, Hubbard, Hudder, Hutchins, Ingalls, Ingersoll, Jackman, Jacobs, Jacobson, Janes, Jeffery, Jeffs, Jenkins, Jensen, Jodrey, Johnson, Jones, Kavanaugh, Kent, Kevany, Kiff, King, Lane, Langsford, Lawrence, Lendall, Lewis, Lindquist, Lothrop, Lowe, Lufkin, Lycett, Macchi, MacDonald, MacInnis, Maclean, Maguire, Manna, Marble, Marchant, Marr, Marshall, Marston, Martin, Mason, Massell, Masters, Mayo, McCuish, McFarland, McGregor, McIntire, McKay, McKenzie, McKinnon, Mears, Merchant, Miller, Mitchell, Morse, Murphy, Nason, Nearis, Nelson, Nichols, Nickerson, Norwood, O'Hearn, Oakes, Oliver, Olson, Osier, Otto, Oxner, Palk, Parkhurst, Parsons, Pascoe, Patience, Patriquin, Payson, Pellier, Perkins, Perry, Peterson, Phalen, Phillips, Pieroway, Pike, Pine, Pinkham, Pittee, Poland, Powers, Price, Prior, Publicover, Quimby, Quinlen, Quint, Rackliff, Ranville, Reddy, Reed, Rice, Riggs, Robbins, Roberts, Robinson, Rogers, Ross, Rowe, Rowley, Russell, Rust, Salter, Sanborn, Sargent, Saunders, Sawyer, Scott, Seaton, Shaller, Shaw, Shepard, Shores, Shuney, Shute, Simms, Simpson, Smith, Sofford, Somes, Sorenson, Spence, Spinney, Stanwood, Steele, Stickney, Stoddart, Stople, Story, Stream, Strong, Sundberg, Sweet, Sweineek, Swenson, Symonds, Tanner, Tarr, Teele, Terry, Thomas, Thurston, Tobey, Tolman, Torrey, Towle, Tucker, Turner, Tysver, Venance, Wadden, Walen, Walker, Warner, Wass, Webber, Wharf, Wheeler, White, Whittier, Wilkins, Willey, Wilson, Winslow, Witham, Wonson, Wykes, Young, Younger. The Genealogy Today catalog number for this item is 11358. When inquiring about the information in this resource, please mention the catalog number.